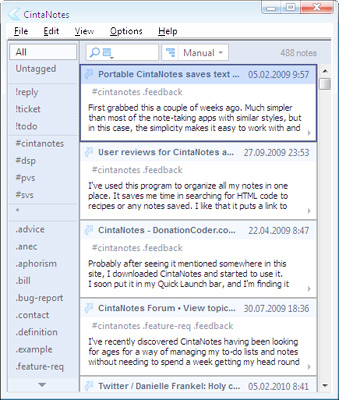 CintaNotes Free Personal Notes Manager is designed to be your indispensable assistant in the daily task of collecting numerous pieces of information, whatever they may be: your own thoughts and ideas, book and article excerpts, job postings, famous people quotes, research data, curious facts, Wikipedia definitions, blog posts, important news, you name it. CintaNotes Free Personal Notes Manager lets you quickly jot down and tag any piece of useful information that you come across while reading documents or surfing the web just select the text and press Ctrl+F12. With CintaNotes Free Personal Notes Manager, this is really all it takes to make a note! CintaNotes Free Personal Notes Manager does not clutter your workspace with "sticky notes", all notes are neatly organized in an easily navigable list. Qweas is providing links to CintaNotes Free Personal Notes Manager 1.6.2 as a courtesy, and makes no representations regarding CintaNotes Free Personal Notes Manager or any other applications or any information related thereto. Any questions, complaints or claims regarding this application CintaNotes Free Personal Notes Manager 1.6.2 must be directed to the appropriate software vendor. You may click the publisher link of CintaNotes Free Personal Notes Manager on the top of this page to get more details about the vendor.